Striped Bass can be caught on the surface with topwater lures or at the bottom with cut baits or jigs. Look for flocks of birds feeding on the surface and striper are usually under the birds feeding on shad. Otherwise, find a good point and toss out an anchovy while chumming a few also. Largemouth Bass can be caught all over the lake with topwater lures in the morning and evenings and drop-shotting plastics in the day. Look for any type of structure that might be holding fish. Fish a medium action rod with 6-8 lb. test. Smallmouth Bass can be caught fishing rocky points and shorelines using white jigs, crankbaits, plastics or live shad. 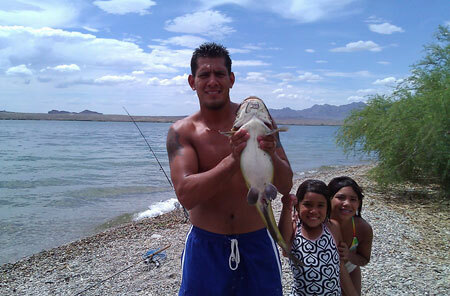 Lake Havasu has a good population of smallmouth bass that are very healthy. Start out fishing rocky points and shorelines with lipless crankbaits and small jigs. Later in the morning when the fish move deeper try drop-shtting or split-shotting plastics. Catfish can be caught all over the lake by dropping down cut-baits or nightcrawlers. Catfish can be caught anytime of day but fishing is more productive if done at night. Panfish can be caught all over the lake in the shallows and around the docks. Try using a bobber with an 18 inch leader and a small hook with mealworm or piece of nightcrawler. Fishing crappie jigs close to boat docks is also very productive. Hot Spots: Docks, Reeds, Rocky Areas, Cattails, Structure, Shallows. Hot Baits: Mealworms, Nightcrawlers, Crappie Jigs, small trout spinning lures.